August 06, 2018 — DJI, the world’s leader in civilian drones and aerial imaging technology, today announced a brand partnership with LINE FRIENDS on its first characterized drone, making drone technology more fun and accessible to a wider audience. 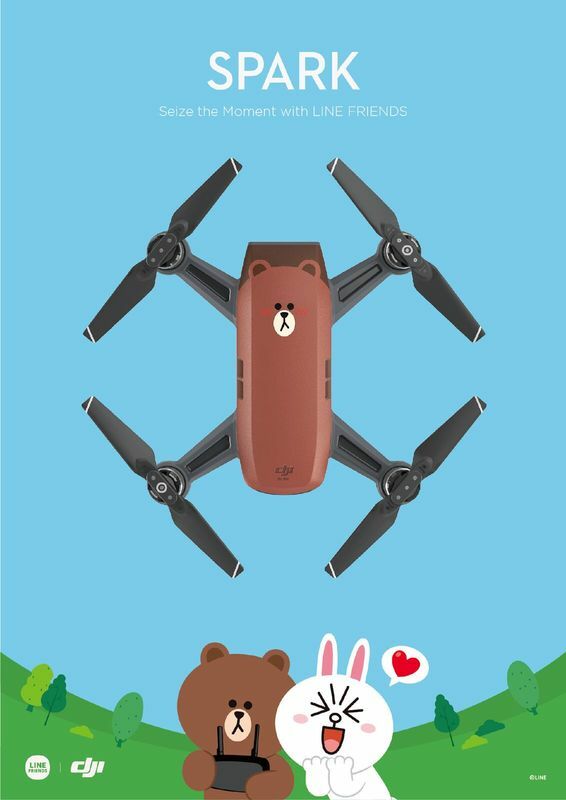 Featuring one of LINE FRIENDS’ most popular characters Brown, the LINE FRIENDS (BROWN) l Spark drone is an easy-to-use, fun-to-fly mini camera drone that lifts off from the palm of your hand to capture and share the special moments in your life on the go. “Similar to other things we carry in our bags, a drone is becoming a lifestyle accessory. This special edition we are launching with LINE FRIENDS will take this concept even further and make storytelling and sharing exciting, and a part of our everyday life,” said Suk. LINE FRIENDS is one of the fastest growing global character brands, and is a subsidiary of mobile messenger operator Line. Its merchandising business began online in 2011 from the creation of virtual stickers and emoticons on the Line mobile app. LINE FRIENDS characters have since then gained popularity and its merchandising business has now expanded to 108 stores globally. Like the DJI Spark, LINE FRIENDS (BROWN) l Spark drone is a full-featured mini drone that fits in almost any bag, ready to launch within seconds to shoot 12-megapixel photos and 1080p videos stabilized with a two-axis mechanical gimbal. It packs an obstacle sensing system and automated flight modes into its soda can-sized body. It is the first consumer drone that users can control by hand gestures alone, successfully removing the barriers between you and your camera in the sky. Spark comes with exciting intelligent flight options that empower you to effortlessly capture and share your memorable moments. QuickShot modes will automatically create a 10-second video from your flight that is ready to share on social media, where everyone can see your special moments. Like all the latest DJI drones, Spark also comes with features like TapFly and ActiveTrack, making flight fun, easy and enjoyable for everyone. The US retail price of the LINE FRIENDS (BROWN) l Spark RC Combo, including an aircraft, one battery, three pairs of propellers, a remote controller, two RC cables, one USB charger and one Micro USB cable is $399 USD. The product will be available for order at the four DJI Flagship Stores and store.dji.com for North America, China, Hong Kong and Korea markets. LINE FRIENDS is a global character brand featuring 11 characters which were originally created for use as stickers for leading mobile messenger application LINE and its 200 million active worldwide users. The company has emerged as a global creator by introducing new Intellectual Property (IP) like BT21, in addition to Animation Running Man and Usamaru. LINE FRIENDS also has collaborated with a number of renowned brands including LAMY, Beats by Dre and Brompton, all aligned with the company’s philosophy and values to showcase premium character products. More recently, LINE FRIENDS has operated 108 stores globally in a total of 11 markets worldwide, in trend leading cities such Seoul, Tokyo, New York, and Shanghai, and became an independent company in January 2015. For more information please visit https://www.linefriends.com/ . DJI is a global leader in developing and manufacturing civilian drones and aerial imaging technology for personal and professional use. DJI was founded and is run by people with a passion for remote-controlled helicopters and experts in flight-control technology and camera stabilization. The company is dedicated to making aerial photography and filmmaking equipment and platforms more accessible, reliable and easier to use for creators and innovators around the world. DJI’s global operations currently span across the Americas, Europe and Asia, and its revolutionary products and solutions have been chosen by customers in over 100 countries for applications in filmmaking, construction, inspection, emergency response, agriculture, conservation and many other industries.